Looking for the best side sleeper pillow? Well, be warned. Your search is not going to be easy, especially because of the abundance of the options that will confront you. It is common for buyers to end up being overwhelmed. With this, allow us to extend a helping hand. 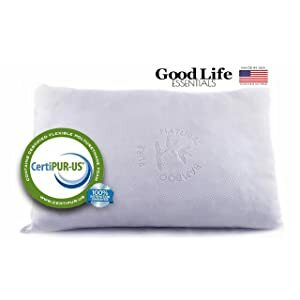 In this post, we will review Good Life Essentials Shredded Memory Foam Pillow with stay-cool bamboo cover- King standard. We will have a quick look at some of its most notable features, as well as some of its benefits and drawbacks. Eco-Friendly: If you love the environment, you will love this pillow. Bamboo is one of the main materials of its cover. Aside from being natural, it is also known for being durable and breathable. Even if you are sleeping during hot weather, the pillow can provide you with proper air circulation, which can be specifically attributed to its bamboo cover. 5-year Manufacturer Warranty: The company stands by the quality of their products. With such, Good Life Essentials Shredded Memory Foam Pillow comes with a warranty that extends to 5 years. This is better than the standard one year warranty that is being offered by most manufacturers. Shredded Memory Foam: This is the main material that is used in this product. It has gained the reputation for being able to offer a wide array of benefits, including personalized comfort. It is going to conform to the shape of the body of the user, which is one of the reasons why it is going to provide the highest level of comfort for people who sleep on their side. Hypoallergenic: This is one thing that may not matter for some people, but for those who often wake up sneezing, this is going to be a big thing. It is free from allergens that can be a precursor to health problems. It can resist dust, mite, mold, and other common causes of allergies. Will Not Go Flat: The long-term dependability of this model is one more thing that we loved. Even with prolonged use, it will stay in its tip-top shape, unlike others that could shrink and turn flat. Machine-Washable: Maintaining and cleaning Good Life Essentials Shredded Memory Foam Pillow is not going to be any problem. It can be machine washed, which makes it effortless to retain its superior quality through the years. Provides a Cooling Effect: This is most probably attributed to the materials that are used, especially the bamboo cover. The latter is known for being hard to rival when it comes to breathability. Can Be Too Firm: There are some instances wherein the users find it to be firm. This can potentially lead to a strain in the neck or head. However, as many have pointed out, after a few weeks of use, it can be softer. Lumpy Spots: This is made from shredded memory foam pillow. Therefore, it is natural that the shredded foam are not distributed consistently. This can lead to a problem as some portions of the pillow can turn lumpy. In sum, while Good Life Essentials Shredded Memory Foam Pillow can be a bit firm and lumpy for some users, it has still been given words of praises by many, asserting that it is indeed one of the best pillows for side sleepers. With its memory foam inner material and bamboo cover, you can be guaranteed of having the comfortable sleep. It is hypoallergenic, long-lasting, and breathable, which are just some of the most important things for a pillow that can significantly improve your quality of sleep.